Hello~ I'm Michelle! 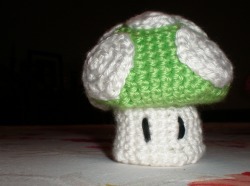 On this site, you'll find all the crochet-related stuff I've made. I was introduced to making amigurumi (crocheted plushies) in the winter time, 2008. Since then, I've made a whole bunch of stuff. I do use patterns for many things I've made, especially in the beginning, but I've also done free form work, made up my own patterns and altered other patterns I've found. This website shows all the different things I've made, both from patterns and originals, and is mostly just a way to show friends what I've done. At this time, I don't make amigurumi or other items to sell, except on a personal commission basis. So at the moment, this site is not a store. However, if you know me in daily life, you can request I make something for you. I basically just charge a $5 flat rate for whatever I make, unless it's difficult for some reason. Anywho~ If you want to know more about just what amigurumi are, check out the About Amigurumi section. If you want to see the things I've made, look over at my Amigurumi Gallery and for regular crochet stuff, look in the Crochet Gallery! Hope you enjoy the site!